1918: Launched by J. Lewis & Sons Ltd (Yd.No.65) (Admiralty standard drifter) for The Admiralty as MIRAGE (Ad.No.3926). 31.7.1920: Transferred to The Fishery Board for Scotland, Edinburgh for disposal. 1920: Sold under HM Treasury mortgage agreement (Disposal of Admiralty Drifters to Ex-service Fishermen) to John Horne, Cockenzie (managing owner) for £6,500, reduced to £4,875; deposit paid £250. 24.7.1920: Registered at Granton as THORNTREE (GN73). Official No.137640. 20.7.1921: Fishing off Berwickshire coast (Sk. John Horne). 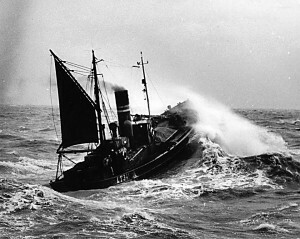 Refused to stop when ordered by Fishery Board for Scotland vessel MAELSTROM (96grt/1919) after being observed fishing inside the legal limit off St. Abbs. Arrested after 60 mile chase and also charged with failing to display or concealing, name and port of registration. At Duns Sheriff Court fined a total of £140. 12.1924: Sold to Adam Vyse, North Shields & W. Wood, Cellardyke (John T. Graham, Anstruther, manager). 12.1924: Registered at Kirkcaldy (KY33). 1928: Sold to James Dougal, Eyemouth. Kirkcaldy registry closed. Registered at Berwick as MARY & JANE (BK271). 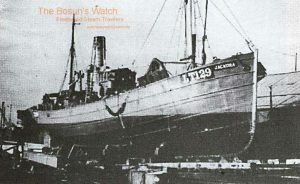 9.1939: Sold to Arthur C. Mitchell, Lowestoft. 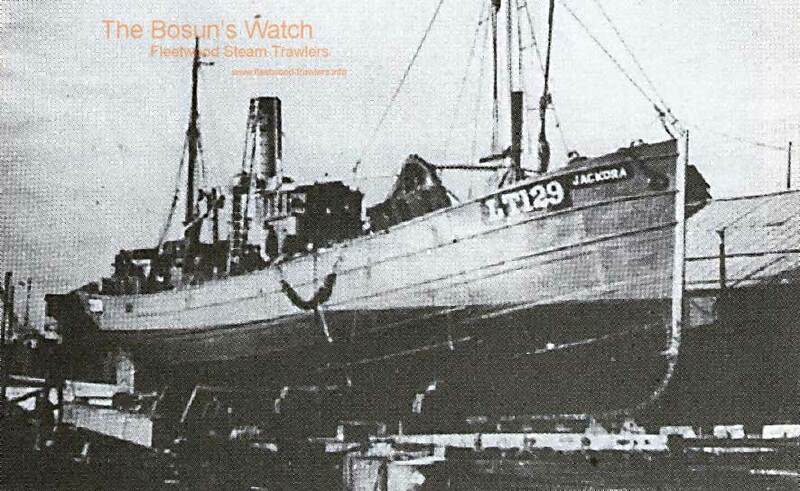 20.3.1940: Registered at Lowestoft (LT129) as owned by Jackora Ltd, Lowestoft (Arthur C. Mitchell, manager). 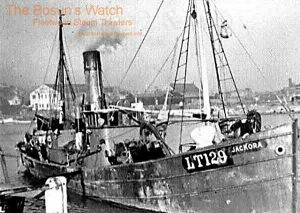 4.4.1940: Registered at Lowestoft as JACKORA (LT129) (BoT Minute R.G.1400/1040 dated 11.3.1940). 1950s: Seasonal trawling for white fish from Milford, occasional landings at Fleetwood. 1.4.1950: Landed 111 boxes, £645 gross. 22.5.1955: Sailed Lowestoft for Antwerp in tow of steam drifter EXCEL IV (LT171) (Sk. Gowan) also for breaking. 16/09/2013: Page published. 6 revisions since then. 21/12/2017: Removed FMHT watermark and added an image. This entry was posted in Drifter/Trawler, Seasonal Visitors, Steam Trawlers, Steamers (Picture) and tagged Admiralty Drifter, Drifter/Trawler, No Fleetwood owners on October 16, 2013 by Fred Smith. 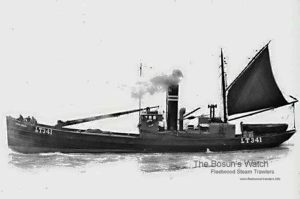 16.7.1927: Launched by John Chambers Ltd, Oulton Broad, Lowestoft (Yd.No.563) for Alan Haward Watson, Lowestoft (managing owner) as OCEANBREEZE. Towed to Gt. Yarmouth to have machinery installed. 21.9.1927: Registered at Lowestoft (LT343). 9.1927: Completed and valued at £4.500. 5.5.1932: Sold to P. W. Watson & Sons Ltd, Lowestoft (Alan H. Watson, manager). 1930s: Seasonal fishing from Fleetwood (John Victor Breach, Lowestoft, managing agent). 4.9.1939: Requisitioned for war service on contraband control (Hire rate £49.0.0d/month). 9.1940: Employed as a boom drifter. 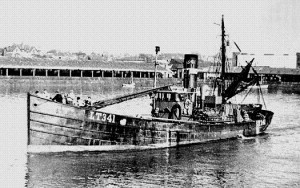 1.1942: At Lowestoft as LL sweep drifter. 11.6.1943: Compulsorily acquired by M.O.W.T. Fitted out as a minesweeping drifter (P.No.FY810). 8.1943: Transferred to War Department. 6.8.1943: Lowestoft registry closed “Registry no longer required”. 20.9.1947: Sold to Arthur Claude Mitchell, Milford Haven (managing owner). 1947: Registered at Lowestoft (LT341). 15.11.1948: At Lowestoft landed 256 crans of herring. 12.1.1952: At Milford landed 176 crans of herring (400 kits) grossed £1,735. 20.10.1952: At Lowestoft landed 120 crans of herring. 6.1958: Sold to Jack Arthur Mitchell (32/64) & Sk. Charles Noel Bray (32/64), Milford Haven. Jack Arthur Mitchell designated managing owner. 6.1.1958: Converted to motor by Richards Ironworks Ltd, Lowestoft, fitted with 330bhp 4 stroke 6VEBM oil engine by Ruston & Hornsby Ltd, Lincoln. 1958: Re measured 118g 49n. 28.5.1958: Returned to Milford from conversion to diesel and fished her way back, catch grossed £511. 20.12.1961: Sold to Jackora Ltd (64/64), Milford Haven. H. C. Mills appointed manager. 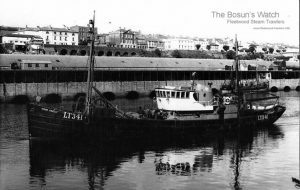 20.8.1968: Motor trawler LORD KEITH (LT181) developed engine trouble while fishing E of Blackwater Light Vessel, Co. Wexford but managed to reach Rosslare Bay. Connected and commenced tow to Milford. 23.5.1970: Registered office transferred to Lowestoft Lowestoft. Vessel on offshore platform standby and safety duty. 1974: Sold to Greek owners. 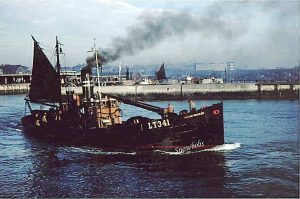 9.3.1975: Sailed Lowestoft in company with motor drifter trawlers WILSON LINE (YH105) and LORD KEITH (LT181) for Mediterranean with stated intention of converting them to refrigerated stern trawlers. 27.2.1978: Owner stated as Theolus Iosifides, Halkis, Greece. 1988: Deleted from registers continued existence in doubt. 16/07/2013: Page published. 9 changes since then. This entry was posted in Drifter/Trawler, Seasonal Visitors, Steam Trawlers, Steamers (Picture) and tagged Drifter/Trawler, No Fleetwood owners, Seasonal Visitors on July 16, 2013 by Fred Smith. 1918: Launched by Colby Brothers Ltd, Oulton Broad (Yd.No.91) (“Admiralty drifter”) for The Admiralty as BLIZZARD. 1921: Sold to Kingston Steam Trawling Co Ltd, Hull (Walter Scott, manager). 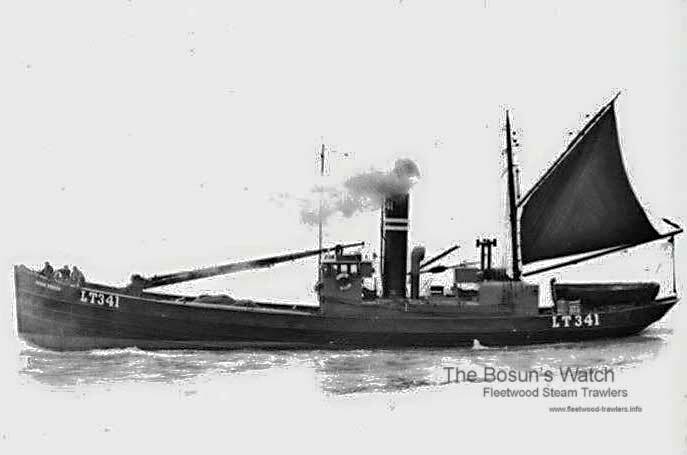 11.7.1922: Registered at Hull as SATINSTONE (H585). 1.1925: Sold to Alexander C. Bruce & Peter Bruce, St. Combs, W. B. Ritchie & Peter Buchan, Fraserburgh, Charles L. Minty, Fraserburgh and R. Irvin & Sons Ltd, North Shields (Alexander C. Bruce managing owner). 30.1.1925: Registered at Fraserburgh as HARVEST GLEANER (FR73). 1938: Seasonal fishing from Fleetwood (Alex Keay agent). 5.1938: Shares sold to Charles L. Minty, Gardenstown & others and R. Irvin & Sons Ltd, North Shields. 17.5.1938: Registered at Banff (BF484). 25.11.1939: Requisitioned for war service as a minesweeping drifter (Hire rate £26.0.0d/month). 28.10.1940: Off Suffolk coast attacked by German aircraft and subsequently foundered. Four crew lost*. 20.4.1943: Banff registry closed “Lost on Naval Service”. This entry was posted in Drifter/Trawler, Lost Vessels, Seasonal Visitors, War Losses and tagged Admiralty Drifter, Drifter/Trawler, Lost, No Fleetwood owners, Seasonal Visitors, War Loss on December 31, 2012 by Fred Smith.